Apex Legends players can finally get their hands on the game’s first season, entitled Wild Frontier, tomorrow. Aside from new Legend Octane, developer Respawn Entertainment hasn’t revealed Season 1’s free content yet, but they have outlined how the game’s first Battle Pass will work. As previously leaked, the Season 1 Battle Pass will cost 950 Apex Coins (around $10), although there will also be a 2,800 Apex Coin “Battle Pass Bundle,” which will immediately unlock the first 25 levels. The Season 1 Battle Pass will have the standard 100 levels to work through, with each one giving you some sort of reward. Most of the rewards are minor stuff like poses, banners, and XP boosts, but there are some more exciting cosmetics mixed in. Also, everybody who buys the Battle Pass immediately unlocks three new skins for Lifeline, Wraith, and Mirage (that’s them in the header). Want to wait on buying the Battle Pass for whatever reason? No problem – all the XP you gain during Season 1 will be retroactively applied to the Battle Pass if you buy it late. So, if you earned enough XP to get to level 20 and then buy the Battle Pass, that’s where you’ll start. Oh, and unlike some other battle royale games (coughPUBGcough) you get to keep all the stuff you earn via the Battle Pass. Not interested in the Battle Pass at all? Even if you just play the free content, you’ll still get a new Legend Skin, 5 loot boxes, and 18 Wild Frontier stat trackers. 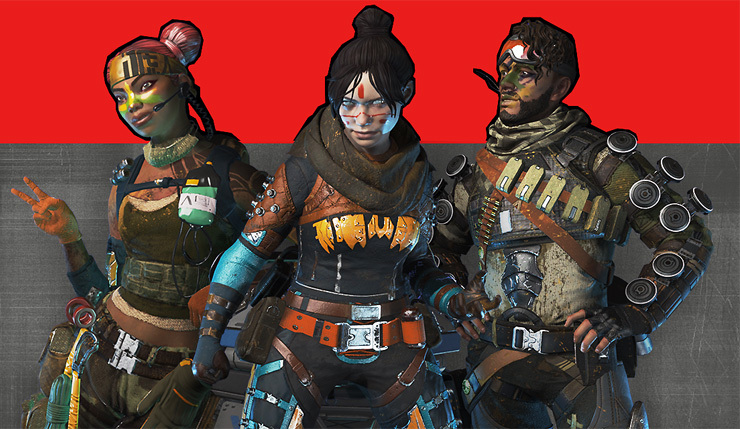 Apex Legends is currently available on PC, Xbox One, and PS4. Season 1 launches March 19.